WestJet named its new budget carrier Swoop and announced plans to begin flying in June of 2018. The airline, which billed itself as a low-cost airline at its inception, created the ultra-budget spinoff to join such U.S. carriers as Spirit and Allegiant, which have captured a significant share of that market with their basic, no frills service. Everything beyond the seat and a seatbelt costs extra on those carriers and they also tend to serve secondary airports where costs are lower. Swoop hasn’t released its schedule but it’s likely to include places like Hamilton, Abbotsford and a few other places that have underused major airports and are near population centres. That’s been Flair Airlines’ (formerly New Leaf Travel) model and it’s gaining some traction in those markets. Not much other detail has been released but it’s expected that the timing of the startup is keyed around the delivery of new Boeing 737 MAX aircraft to WestJet, freeing up older 600, 700 and 800 airframes for the budget airline. 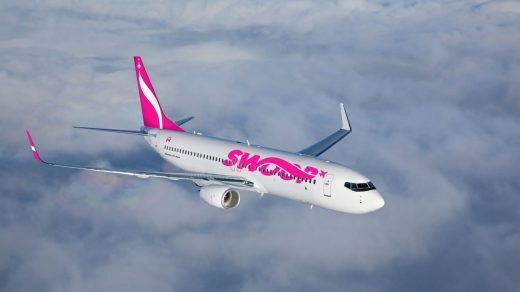 Most of those have already been converted to WestJet Connect, a pay wall-enabled entertainment system that is still free on the main line and would be a significant revenue generator for Swoop. Other extra charges will include baggage, food, beverages and possibly gate services like in-person check-ins and other functions that can be done online.